Hi, I am interested in your 1970 Chevrolet Chevelle (stock #4669-ATL) listed on Autotrader for $62,995. I'd like to get more information about this vehicle and confirm its availability. The timeless appeal of a classic muscle car with a host of upgrades to enhance its real world drivability, and all built on the foundation of a genuine Super Sport Chevelle! 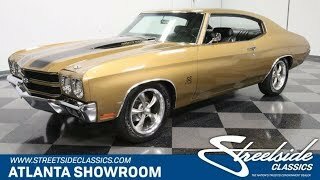 This 1970 Chevrolet Chevelle SS Restomod definitely has a lot to offer. Its just 700 miles past a very well-thought out restoration and offers a driving experience every bit on a par with its stellar good looks. The exterior remains in factory configuration and has been restored to a state thats sure to cause admiring stares wherever it may roam. Its gold paint shows a consistently smooth texture and a strong shine, and the pair of broad black stripes that run across both the hood and deck lid look razor sharp as they pass over the subtle cowl scoop. All the finishing touches have been looked after here - the color combo was skillfully applied and looks impressive even at close range, there are new bumpers in both front and back, as well as a collection of new trim, and every emblem and badge is properly placed and looking its best - the painted SS emblems behind the front wheels are especially eye-catching. All these elements combine to create a Chevy classic thats in awesome form. A simple exterior detailing will no doubt equip this Chevelle to be a formidable presence on the car show circuit. The interior is a showstopper as well. Its been restored to a largely factory configuration, with some inspired upgrades blended in, to create an outstanding vintage driving environment. Climb inside and youll be surrounded by new components wherever you look - the buckets in front, the bench seat in back, the door panels and the snug-fitting headliner above were all recently added. The dash area is another strong feature, with an array of crisp aftermarket gauges perfectly fitted into the instrument panel and a supple, straight pad running across the top. The original AM/FM radio still occupies its center position and the air conditioning blows strong through the in dash vents to keep you and your passengers comfortable. This Chevelle offers an awesome driving experience by any measure you could possibly use. Outstanding acceleration comes via the fuel injected 5.7 liter LS1 engine standing by under its cowl hood in a very nicely detailed engine bay. The V8 started off with 345 horsepower and, with a performance cam added to the mix and a pair of long tube headers reducing back pressure as they lead out to a Flowmaster dual exhaust, it only goes up from there. The combination also produces just the deep, rumbling exhaust note youd want in a classic like this. The engine pairs with a 6 speed T56 transmission thats geared to extract every bit of available performance and is a great complement to the 3.90 posi rear end that rounds out the drivetrain with asphalt scorching off the line ability. Running through the gears is an absolute pleasure, not only is it every bit as exhilarating as you can imagine, but the clutch engagement is seamless and the T56 shifts very smoothly. The car tracks straight as an arrow and, since Chevy had already equipped its Chevelles with coil springs in back by the time this 70 rolled out, its ride is smooth and quiet. Equipped with power steering and upgraded power disc brakes at all four corners, the navigation is easy and the stops come quickly and with little effort. This impressively equipped classic rides on a set of 17 Ridler wheels wearing Goodyear Assurance tires. With its inspired blending of an outstanding vintage foundation with welcome modern upgrades, this 1970 Chevrolet Chevelle SS Restomod is a unique find. Call today!